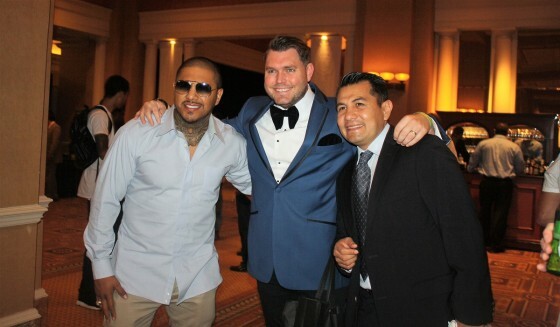 I have been knowing young Money Prince Duarte for some years now in the city of Las Vegas and have always made it a custom to catch up with Prince at all of the big fights in town. This weekend’s Floyd Mayweather vs. Conor McGregor showdown was no exception, as I spotted Prince and his family at the official weigh-in on Friday afternoon. I was able to catch up with Prince and get his prediction for tonight’s fight, as well as the latest with his career. Earlier today, inside of the T-Mobile arena in Las Vegas, Nev., former five-division world champion Floyd Mayweather and UFC superstar Conor McGregor made weight ahead of their scheduled mega fight on SHOWTIME pay per view tomorrow. 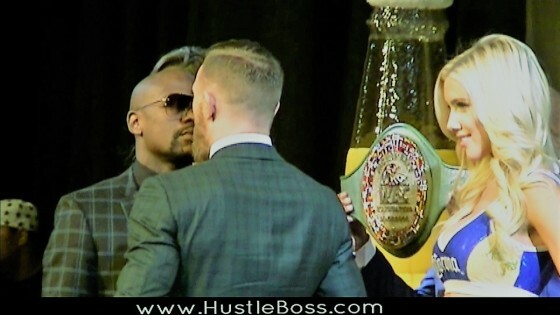 McGregor came into the arena first, with Notorious B.I.G.’s “Hypnotize” playing in the background, while Mayweather came out to Phil Collins’ “In The Air Tonight” shortly thereafter. On Wednesday afternoon, inside of the MGM Grand’s KA Theatre, the final press conference for this weekend’s Floyd Mayweather vs. Conor McGregor pay per view mega fight took place. Mayweather (49-0, 26 KO’s) will meet McGregor (0-0) inside of the T-Mobile Arena on Saturday night in one of the most anticipated events in sports history. There was a lot to take in at Tuesday’s press conference, from Mayweather’s emotional parting speech to McGregor’s boisterous trash talk. Check below for some video highlights from the final presser. 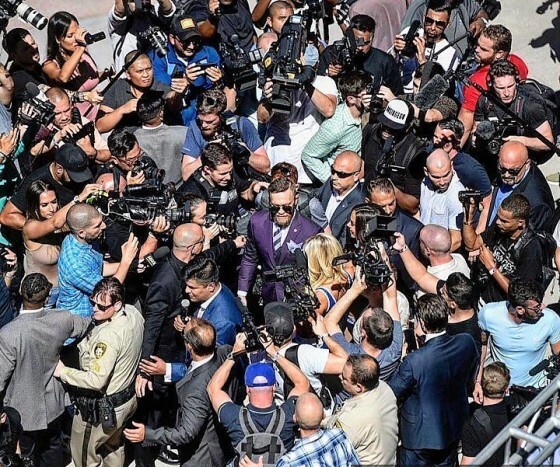 Former five-division world champion Floyd Mayweather and MMA superstar/aspiring boxer Conor McGregor both made their grand arrivals to Las Vegas on Tuesday afternoon, in front of the T-Mobile Arena. Mayweather (49-0, 26 KO’s) and McGregor (0-0) will meet on Saturday night in one of the biggest events in sports history. Check out the video below for a closer look at Tuesday’s arrivals. This weekend, the 2017 Nevada Boxing Hall of Fame induction ceremony took place inside of Caesar’s Palace in Las Vegas, Nev.
Once again it was a gathering of today’s brightest stars, legends and champions from the past, diehard fans from across the globe, as well as several other luminaries from the sport of boxing. Once again, Hustle Boss was in the building and we were able to capture some exclusive behind-the-scenes shots. If you are into the boxing scene in Las Vegas and in search of a diamond in the rough, perhaps Cuba’s Yordenis Ugas might be worth some of your time. The 31-year old welterweight contender carries a 19-3 record with nine knockouts, yet it has been his recent run of success that has caught my eye. 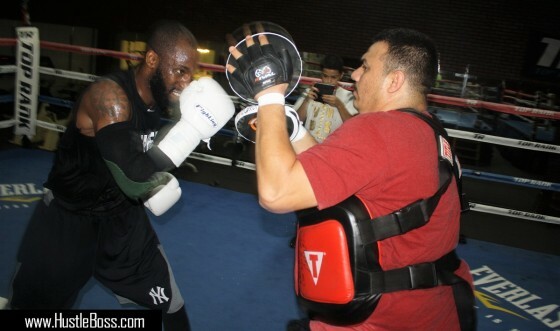 In August of last year, returning from a two-year layoff, Ugas upset previously-undefeated Jamal James over ten rounds in Verona, New York.